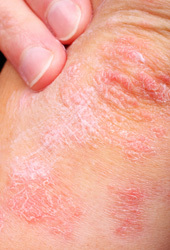 The word eczema describes certain kinds of dermatitis (inflamed skin). The word “atopic” refers to a tendency for excess inflammation in the skin, linings of the nose and lungs. Early eczema can be red, blistering or oozing. Later on, eczema can be scaly, brownish or thickened. Almost always, eczema itches. Atopic dermatitis often runs in families. These families may have allergies such as hay fever and asthma, but can also have sensitive skin and a history of eruptions called atopic dermatitis. The disease can occur at any age but it is most common in infants to young adults. Treatment: See a dermatologist for advice on avoiding irritating factors as well as proper bathing, moisturizing and dealing with emotional upsets which may make the condition worse. A dermatologist can prescribe external medications such as cortisone creams, ointments or lotions and sometimes tars. Many other treatment options are available and can be discussed with a dermatology specialist.